In this study conducted by the Swiss Ice Hockey Association, eye tracking was used to study gaze behavior during the physical task of shooting in ice hockey. The study generated new insights into the gaze behavior of successful shooters, which will be used to develop shooting techniques and training methods to maintain progress in shooting skills. Gaze behavior in sports has long interested scientific researchers who have studied gaze behavior for about 20 years. Eye tracking is increasingly being used in sports research and by some of the leading research institutes as a standard methodology. Mobile eye trackers enable researchers to unobtrusively capture gaze behavior during dynamic motor activities and to learn about the correlation between gaze behavior and precision of movements or good decision making. For instance, eye tracking is used in several sports to examine gaze behavior during physical tasks like shooting, targeting and goaltending. This study was conducted by the Swiss Ice Hockey Association to improve training methods, focusing on the technical and psychological aspects of shooting. Eye tracking was used to study the gaze behavior of players executing slapshots directly after a pass. Specifically, researchers wanted to find out if there are different gaze control types that correlate with a high scoring efficiency when executing a slapshot directly after a pass. It is the first scientific study by the Swiss Ice Hockey Association in this field. 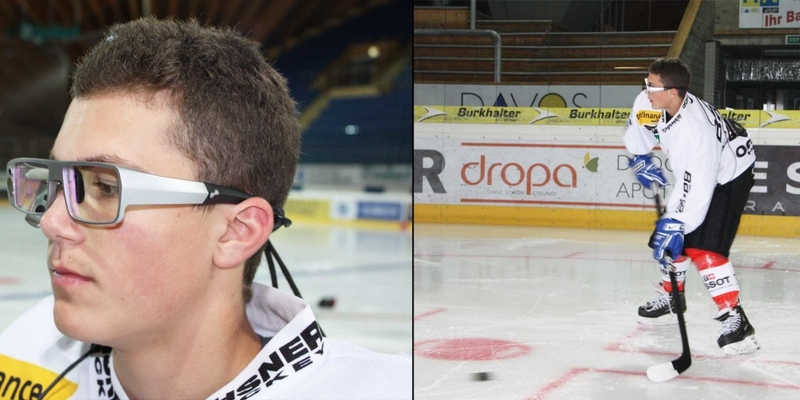 Tobii Pro Glasses proved to be capable of recording gaze data in very dynamic sport tasks. In a first round, twelve offense and twelve defense players of the Swiss National U17 Team executed 48 shots divided into four segments: 12 shots on a shooter tutor with no gaze requirement, 12 shots on a shooter tutor with the requirement to focus on the puck while shooting, 12 shots on a shooter tutor with the requirement to focus on the net while shooting, and 12 shots with a goaltender and no gaze requirement. In a second round, the best eight of each group repeated the 48 shots. In a third round, the best six of each group repeated the test with 8 shots per task. During the third round, the most successful players' eye movements were collected. While executing the shots, each player wore a pair of Tobii Pro Glasses 1 that recorded their gaze. Researchers also used an external, high-speed digital camera at 240 frames/second to document the players' fast movements. In Tobii Pro Studio, the eye tracking records were exported as video files and analyzed manually, frame by frame. Mean durations of fixations and pursuit tracking on the puck, ice and net were calculated using MS Excel. These durations were put in correlation with the scoring efficiency of each player. The use of eye tracking was vital for the Swiss Ice Hockey Association to gain new insights into the gaze behavior of successful shooters. The results will affect key points of shooting techniques and the coaches' training methods. To safeguard the knowledge acquired about successful shooting, the Swiss Ice Hockey Association will not make the results public. Further studies that analyze other essential ice hockey tasks will be discussed and eye tracking will be used again in further research. We chose Tobii Pro Glasses because it provides maximal freedom of movement for the person tested. The glasses worked very well with every player we tested and calibration was very quick and easy, making it possible to test many players in a short time.